The economic pressures of the last three years have forced businesses to focus on cost reduction, often ahead of everything else. At the onset, the belt-tightening in the customer contact organization was viewed as temporary but deep. In the darkest of days, agent occupancy requirements and service levels were tweaked in many business units. Team sizes often expanded, scope of responsibility, broadened, and support functions were thinned, with the few levels or functional groups left untouched. 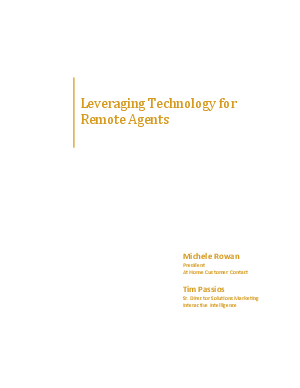 Read on to learn more about leveraging technology for remote agents.